A young American learns invaluable life lessons through basketball. When Dave Fromm graduated from college with good grades and high LSAT scores, he planned to apply to law school. But he actually wasn't that sure he wanted to go, at least not right away. A few years earlier, he'd been to Prague for a vacation and played a game of pickup basketball there. He was a decent basketball player, though not good enough to make the team at Boston College either time he'd tried out. So he did the kind of thing we'd all do if we had the guts (and a foolhardy sense of determination) - he moved to Prague to play basketball, even though he didn't speak Czech, or know anyone in Prague, or if the Czechs had basketball leagues there, much less professional leagues, still less if they let foreigners play. 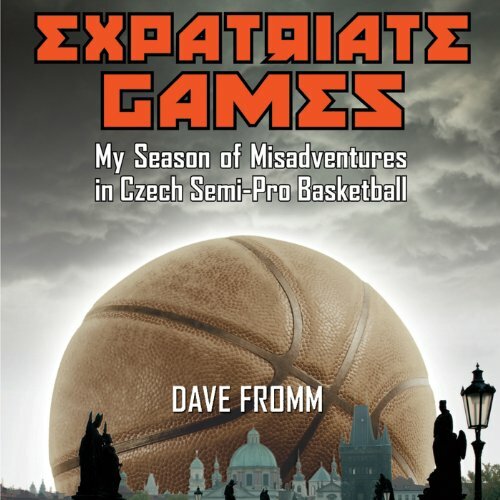 Expatriate Games is Dave Fromm's touching and amusing memoir of the year (1994) he spent playing basketball for TJ Sokol Krlovsk Vinohrady, a Czech semi-pro team. Throughout, Fromm, a self-proclaimed "gym-rat", struggles with his teammates, the European style of play, and the language barrier. But miraculously, Fromm describes how, despite the struggles, the team came together, a girl appeared, and he was introduced to a side of Prague most foreigners can't see - a Prague full of ghosts and back alleys and a people simultaneously embracing and reeling from transition.